We Become Foggy | Sprezzatura, Y'all! Remember the nebbiolo grape from the Piemonte region? 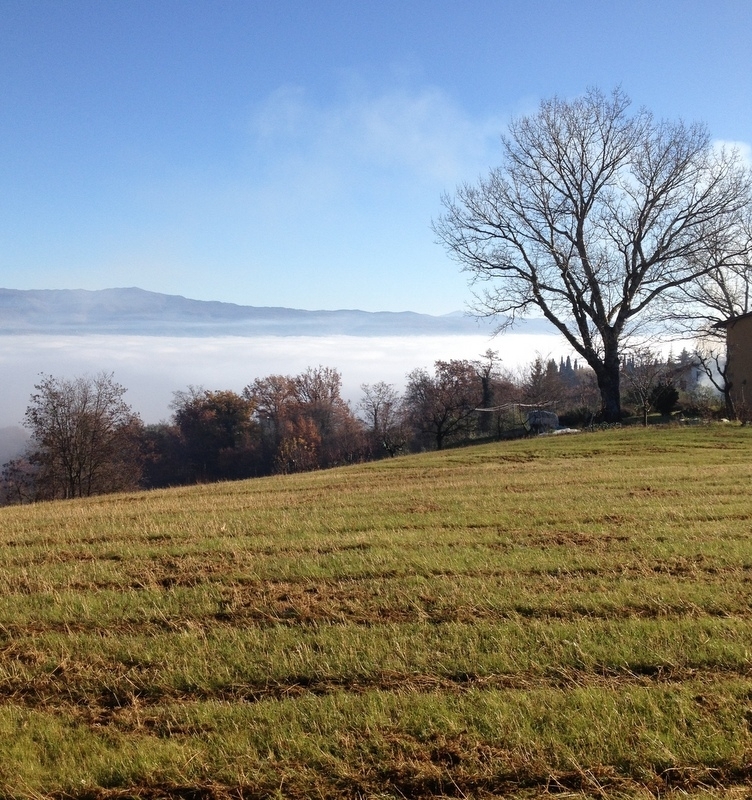 How it’s named after the fog (nebbia) and how pervasive the fog is there all the time? The fog there starts out dense in the morning, but then burns down to a haze for the rest of the day. Here there is plenty of fog, but it behaves differently. Anghiari is not high up – it’s kind of a hill town, but not really. It’s on a ridge, so that if you look at from one side, you really can’t see it. If you look at from the front, from the east, you see it, but it’s not high up on a hilltop like Todi, Cortona, or Montepulciano. But it’s high enough that you can look down into the valley. The hills and mountains here form a perfect bowl of a valley that is flat and green. Some mornings you look out and see nothing but the peaks of the Apennines projecting over the sea of fog that covers the valley. The weather here in the fall and winter is amazing. In the summer, it’s just sunny and hot. But in the fall and winter, it’s very changeable. The villagers know what the weather will be every day. They can tell if the clouds that cover us in the morning will produce rain or just burn off. Forget looking at the fancy weather apps on your computer and phone – just find a local and have him look up into the sky and nod or shake his head. There’s your weather report. And the apps – they’re hardly ever right. What would Glen Burns say about all this? Despite the clouds and fog, it really doesn’t rain here that much. Usually when it rains, it rains for a few days straight so that it feels like a lot, but it’s really not. But there’s a lot of humidity here. We’re from the south, so we know humidity. But this is winter humidity, not summer. Some of you will know what I mean by this – you know how when it first starts getting cool and the humidity drops your skin suddenly becomes like parchment paper? Dry, itchy, chapped, red? That doesn’t happen here. The humidity is always high enough, even when it’s cold, to keep your skin lubricated. So when it’s cold, and humid, it feels really cold. Just like when it’s hot and humid, it feels really hot. We’ve only had a few days and nights below freezing, but it feels like it’s much colder because of the cold moistness in the air. I’d rather have that, than the dry cold that we usually have in Atlanta. I remember how the skin all over my body felt like it was shrinking. Because of all the humidity, the ground stays moist. It can not rain for weeks and when we do get a shower, the ground is so saturated that puddles form immediately. The farmers here plow their fields with these huge plows that go very deep and churn the earth in big chunks. That’s so that all the moisture can get down into the ground and help them through the next growing season. The winter landscape here is quite beautiful. It’s constantly changing and no two days are alike. The fog adds a layer of interest and depth. Especially when you never know what kind of fog you’ll have – heavy, thick, can’t see a thing fog that lasts all morning, or wispy, moving fog that dances around the trees and hills. It’s hard for me to remember the summer now. Sleeping with the windows open, flowers everywhere, gelato everyday. Now I only have gelato once a week or so and it is very sad. But we walk through the foggy mornings and sometimes foggy evenings with our coats, gloves and hats and feel just as happy to be here as ever. All the outdoor seating for the cafes has been gathered up and everyone eats inside now. Some places have lost about half of their seating capacity. But they’re still full and bustling with people and serving good winter food. The fog keeps coming and brings the moisture with it that nourishes the ground. And we watch it roll in and out. Lovely! 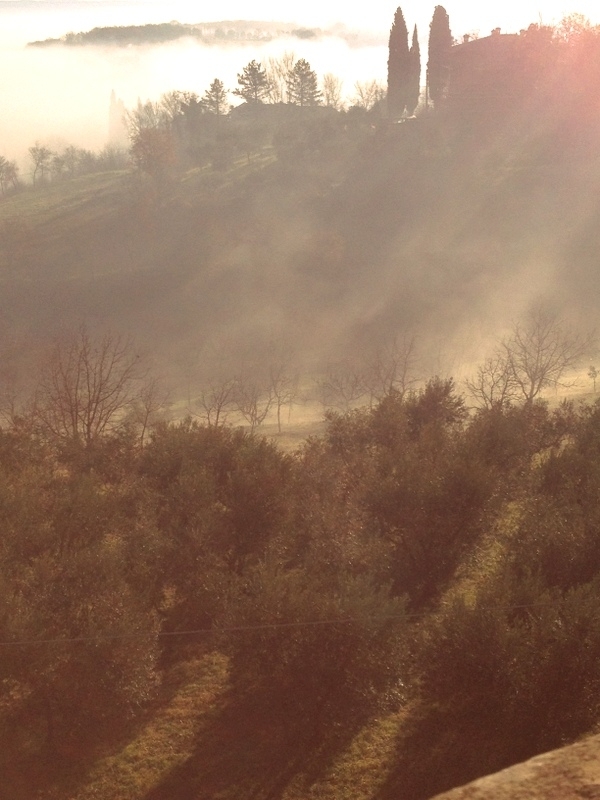 We love the mysterious nebbia! Fantastic pictures, Cathy. Keep taking the beautiful pictures.Guess it wouldn’t matter, but it appears to be lots of places to go, food to eat& good wine to drink! Yes – there’s no end to the wonderful, beautiful places. And the food is amazing. I think I may gain a few pounds here at the end trying to eat as much as possible! Love this,Cathy! Wonderfully written and photos are perfect . Thanks, Vee. It’s really quite amazing here. Each day is different than the one before.